The Haner Ivan R. Sabel Foundation, in conjunction with its partners in the Haitian Amputee Coalition – The Harold & Kayrita Anderson Family Foundation, Physicians for Peace, The Catholic Medical Mission Board, and Donald Peck Leslie, M.D. of the Shepherd Center, created a prosthetic and rehabilitation center in Haiti called the Hanger Clinic (a.k.a. Klinik Hanger). Equipped with more than 13,000 lbs of prosthetic fabriction equipment and machinery shipped from the United States, the Hanger Clinic is located at the Hôpital Albert Schweitzer (HAS), an undamaged local hospital with a high clinical reputation 60 miles from Port-au-prince in Deschapelles, Haiti. Staffed by U.S. prosthetic experts from Hanger Orthopedic Group and Physicians for Peace in conjunction with local Haitian medical professionals, the Hanger Clinic has been fully functional since Monday, February 22, 2010. 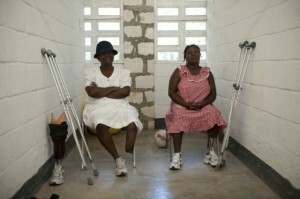 As of August 2010, nearly 600 Haitian amputees have received prosthetic care at the Hanger Clinic in Haiti.